I haven't really made time to think of my menu this week.....I've got so much on my mind but, I can't put this on the back burner forever....we have to eat, right? Ok, so I noticed today that I haven't planned meals for Saturday & Sundays and the reason for this is that these are my off days :) Sometimes I will cook, but these will be spontaneous meals like BBQ items - burgers, grilled chicken....or its takeout for the whole weekend! Now in the summer we spend our weekends away from home, either at the beach or my sister-in-law's pool so I can't plan meals for these 2 days! This is my plan for the week!! What are your plans? 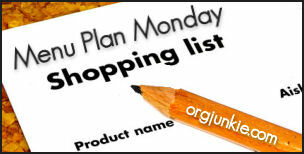 Need some more ideas, visit I'm an Organizing Junkie for more menu planning ideas.